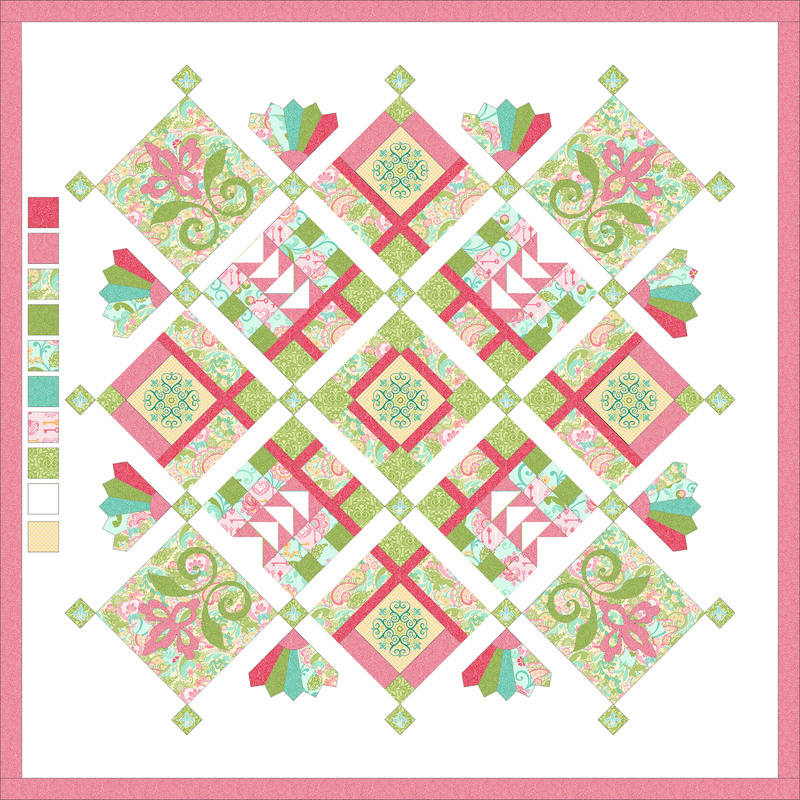 A question on The Free-Motion Idea Book/Sampler Facebook Group yesterday that I had not posted that BERNINA is bringing back my Sundance Sampler that I designed exclusively for them. They asked me ro revise the SKUs using Carina, which is in stores now, and these SKUs, as well as the directions, are available to U.S. BERNINA dealers. And (hint, hint) there might just be something to go along with all of this when automation for the Q 24 comes out! Anyway, I’ve planned out three color stories this time. I’m normally partial to aqua, but I think I’ll sew the pink this time for a change . What do you think? I would like to know if there is a kit for your new Sundance Quilt. 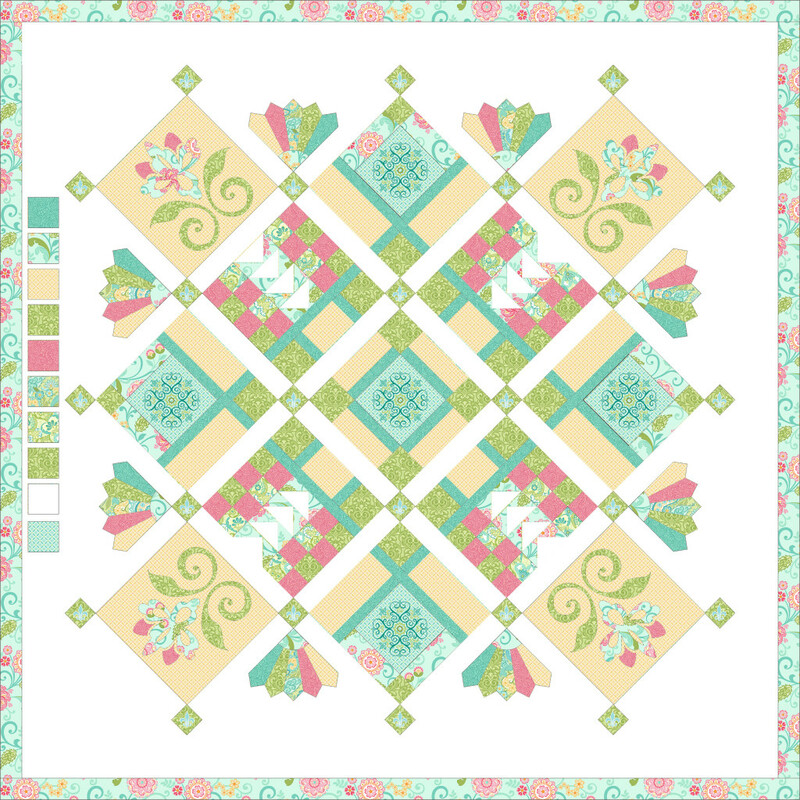 If not where can the fabrics you used be purchased, also the pattern for the quilt which is not in your on-line shop. I’m partial to the pink colorway, too. 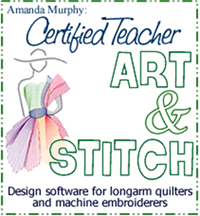 Is this embroidery or applique/piecing? 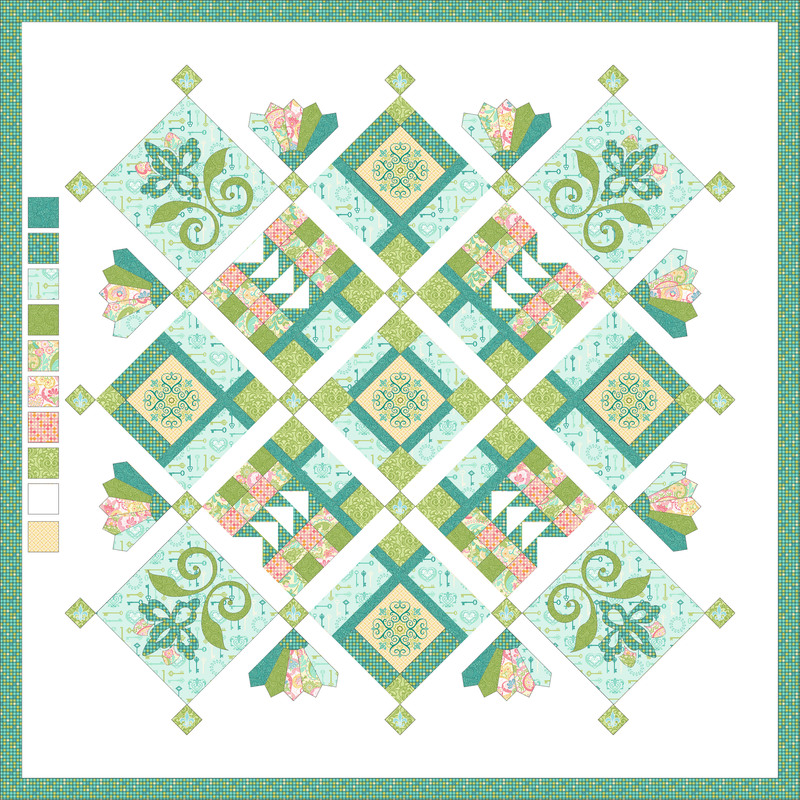 Since this was a sampler designed for BERNINA to feature the capabilities on their machines, there is embroidery in 5 of the large blocks. There is also embroidery in the little cornerstones. Both are optional. You don’t necessarily need it in the cornerstones and could fussy-cut a feature print for the larger blocks. I’d be happy with any of the colorways, but the pink is my favorite. It’s not easy to find any of the pink shades that aren’t 30s or baby-ish prints. I’ll be looking for these fabrics! Hi Amanda, I remember when Sundance came out and I just had to have the pattern. 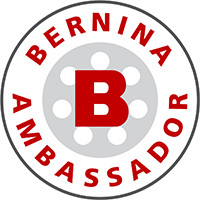 However, I visited two Bernina stores (both two hours away) and neither knew what I was asking about. Will there be another way to obtain the pattern or order a kit? I love the last combination by the way, so beautiful! Oh great job, is a beautiful job. Congratulations ! OMGosh Amanda. You don’t know me or anything. I just found your blog somehow. Imagine my surprise when I clicked on my latest email from fabric.com. I may have to ignore my resolution to not buy any more fabric!! I have two darling granddaughters, ages 7 and 1. The 7-year old is barely 7 and she is making a little sawtooth star quilt for her baby sister. I have an Accuquilt Go Electric cutter and she has done all the cutting and sewing. I iron things for her. It is so rewarding teaching her to sew, though sometimes I wish she would leave me be, but I know she will be a teenager before I know it and want nothing to do with me. Haha. Hopefully not, but she loves being in my sewing room, which is pretty eclectic and colorful with our finished blocks hanging from ribbon strung around my room up high. She calls it the “girls sewing club room”.